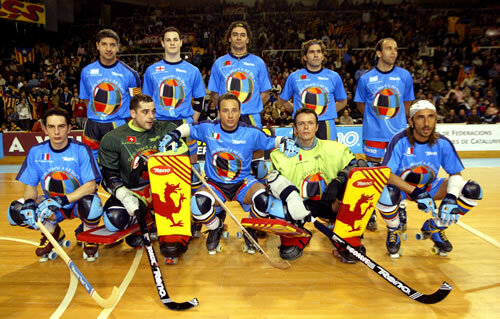 Pictured left to right: standing: Jose Luis Paez Argentina, James Taylor England, Sergio Silva Portugal, To Neves Portugal, Carlos Lopez Argentina, Front row: Sebastien Landrin France, Bjorn Mauer Switzerland, Mirko Bertolucci Italy, Olivier Gelebert France, Alexandro Bertolucci Italy. Reno, Spain recently celebrated their 70th Birthday and it shows in the quality of their goalkeeper equipment, which is made using only the finest materials. Latest design and made to FIRS specification, both the gloves and leg guards are produced in one size only. Both Aitor Egurrola & Sergi Fernandez of FC Barcelona and Spain, wear Reno kit. So order yours today and get practising! Professional Model - All leather. The latest designs from Reno. Extensive research has gone into the production to make the gloves and leg guards the lighest on the market. High density rubber inner linings give maximum rebound and lastability. The gloves are very comfortable and the leg guards have a flexible boot cover for extra manoeuvrability. Choose from red camouflage, blue camouflage, Dark all black, Crazy clown and others. These cool designs mark a new era in style for the professional goal keeper! Reno Exel model - An economically mid priced range of goal keeper gloves and leg guards. The Exel models, styled on the best selling ‘Professional’ range are competitively priced, long lasting and give excellent rebound characteristics. Available in red Wall, yellow Wall both shown below or black/yellow Maori style. Supreme Model - Professional - An all new concept design from Reno. Combining leather with high density rubber, gives the new equipment superior rebound on the glove pad and leg guards. The left hand glove pad has an added layer of rubber, enabling you to target the ball rebound where you want it to go! 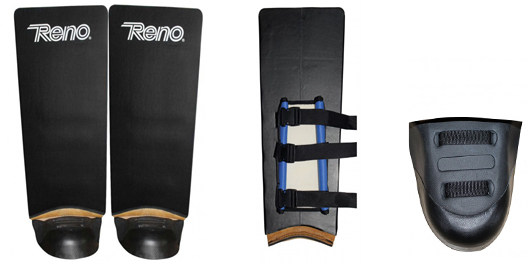 Completely redesigned leg guards benefit from double boot cover straps and an extra locking mechanism to keep the guards from moving on the leg. Supreme is the ultimate in keepers kit, very strong and built to last. If you want the best go Supreme .Stocked in all black. Pictured below. 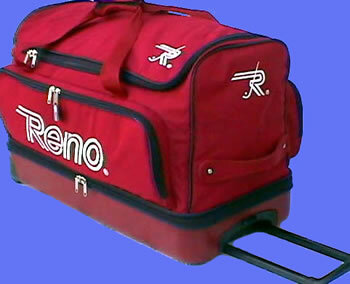 5 Compartment trolley bag - The updated new medium sized Reno bag. Stores everything the modern goalkeeper needs. The bag comes with a rigid base, so no more wet kit ! Heavy guage nylon material,wheels with bearings and very strong zips. If you want the best then get Reno. Available in red, navy blue, blue and black. Size approx: 77 x 33 x 50cm. Pictured above. Reno 6 compartment T90 wheelie bag - All new for 2015 and priced at an unbeatable £59.00. The bag has a large central zippered compartment, with additional top pocket. 2 large end pockets, one suitable for helmet storage. 2 side pocket, one of which is webbing to hold wet kit! The bag also has a lifting handle on each end in addition to the pull out handle. Colour blue/light blue/black/silver. Dimensions 90 x 40 x 46. All new Luxury keepers strong chest pad. Benefits include over sized shoulder pads, large flexi frontal area to absorb the hardest shots, tough upper arm ptorectors, padded collar area & back. The luxury material is finished in black/blue with Reno gold logo. All sizes stocked. Lux elbow pads - New to Slapshot these luxury goal keeper elbow pads are fullly flexible with a rigid elbow cup. Top all round protection to the elbow and front fore/upper arm. Black with gold Reno embroidery. All sizes. Pictured above left. Lux padded shorts - New to Slapshot these luxury goal keeper padded shorts have armadillo style padding which gives added protection to the base of the spine, hips and thighs. Extremely comfortable to wear, lightweight stretch lycra fabric. Not to be confused with Ice hockey products these shorts are made specifically for roller hockey. Black with Reno gold embroidery. All sizes available. Pictured above. Lux thigh, knee, shin protectors - New to Slapshot these luxury goal keeper leg protectors have tough padding which gives good protection to both keepers thighs, knees and shins. Made from a lightweight stretch lycra fabric, the comfortable fit ensures full flexibility of movement. A new product made specifically for roller hockey. Black colour with Reno gold embroidery. All sizes stocked. Pictured above right. FIRS Approved goalkeeper equipment from the new Roller One company. Each item is handmade in Portugal from the finest materials and to exceptionally high technical specification. Used by the national teams of France and Brazil amongst others. Roller one Potenza - The very latest in goal keeper equipment from Portugal. 3 layers of foam combine to make for excellent ball rebound and product longevity. The leather covered foot allows the keeper to manoeuvre around the goal area with ease! Available from stock in all black as shown above, other colours to order. All new Italian design super tough keepers chest pad in black/grey. Benefits include over sized shoulder pads, large flexi frontal area to absorb the hardest shots, tough upper arm ptorectors, padded collar area & back. A top quality product at a very competitive price. All sizes stocked. Reaction padded shorts - Newly styled. Armadillo style padding gives added protection to the base of the spine, hips and thighs. Extremely comfortable to wear, lightweight stretch Lycra fabric. Not to be confused with Ice hockey products these shorts are made specifically for roller hockey. Sizes stocked XL, Large ,Medium, Small and XS. Colour all black. 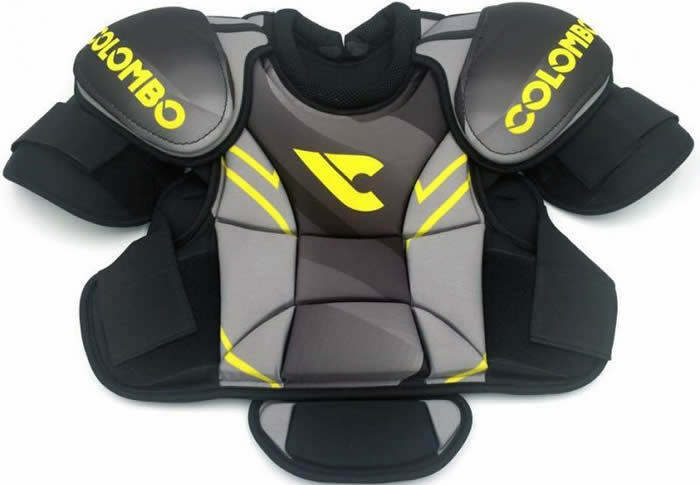 Reaction goal keeper elbowpads - Newly styled. 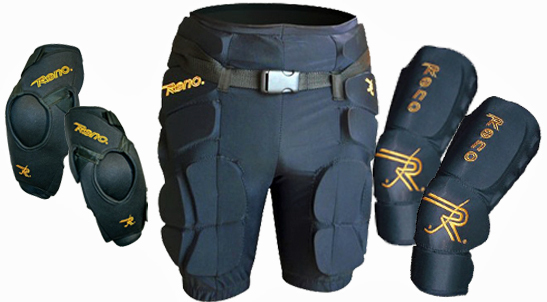 Reaction thigh/knee/shin protector - Armadillo style padding gives protection to both keepers thighs, knees and shins. Made from a lightweight stretch Lycra fabric, the comfortable fit ensures full flexibility of movement. A new product made specifically for roller hockey. Jet black colour. All sizes stocked. Pictured above right. Reaction inner gloves - Italian styled inner gloves with padded fingers and backs. No more skinned knuckles. Jet black in colour. All sizes available. 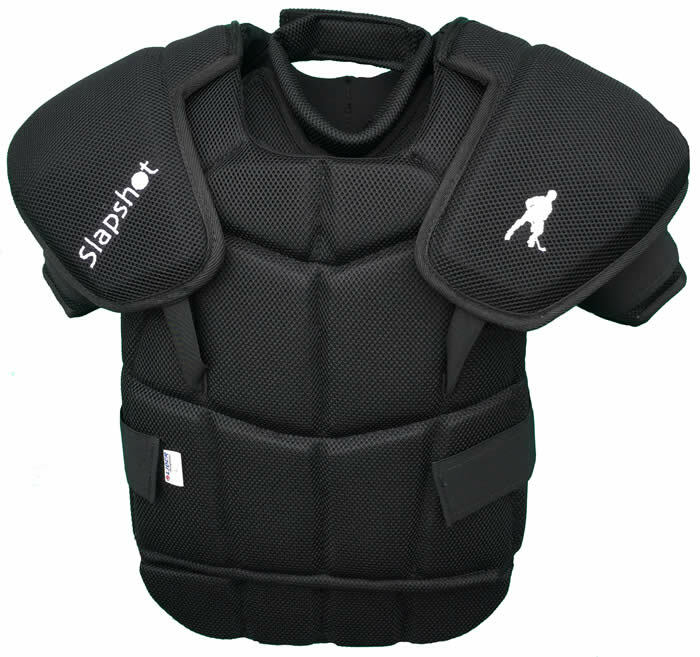 Slapshot Blaze chest pad - New styling for 2017, this top quality over sized chest pad is one of the strongest! The new outer skin is made from breathable microfibres which keep you cool! New super light dense foam front multi panels, stop the hardest shots, but gives comfort and flexibilty to the wearer. 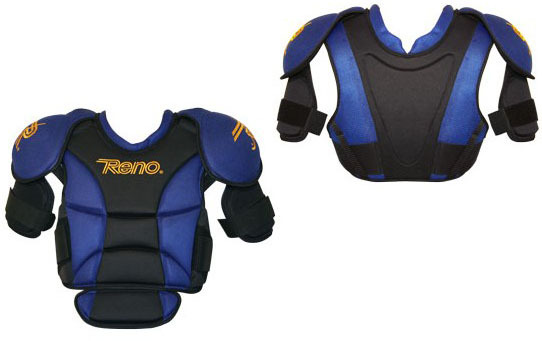 Over sized rigid shoulder pads and flexible upper arm protectors. 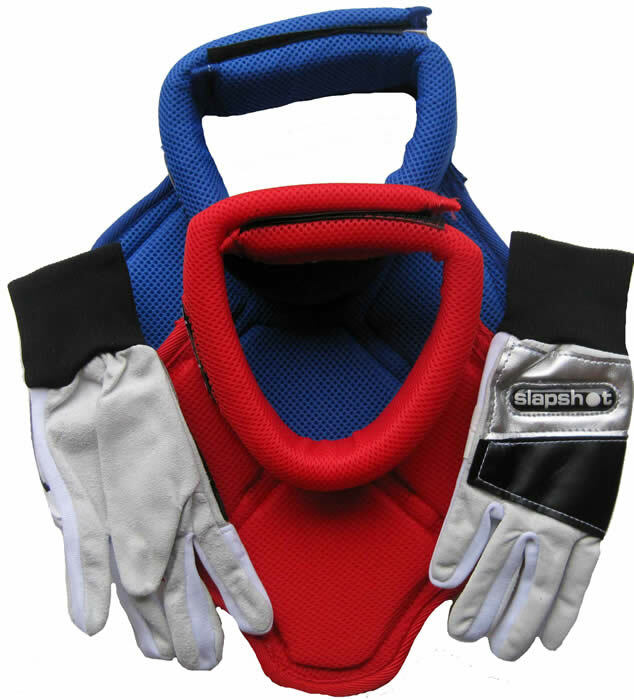 Included is the free neck and collar protector, which attaches with velcro to the upper chest of the pad. Senior and junior sizes in stock. Colour all black. Slapshot Blaze neck and collar guard - All new neck & collar protector with the latest cool mesh fabric. Available in electric blue, electric red or all black, badged with the 'Slapshot' logo. Sizes from Large to extra small stocked. 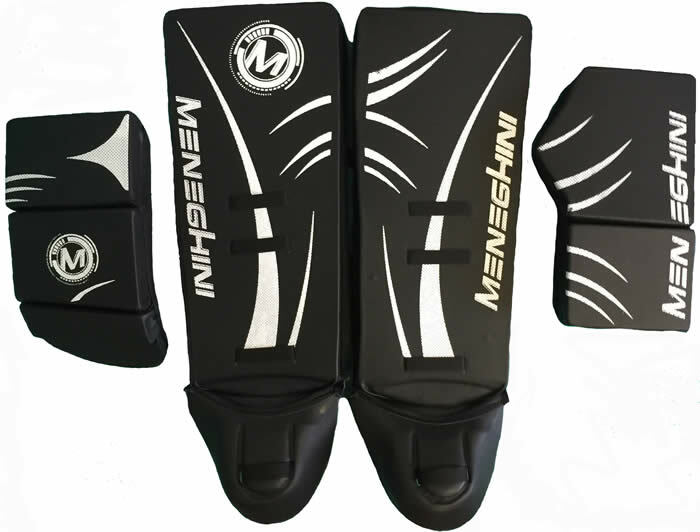 meneghini 'Black' goalkeeper gloves & leg guard set - A good quality economic set of gloves and leg guards. Made from tough rubbers to give maximum ball rebound & covered with a strong outer fabric for longer life. Styled in all black with the silver new meneghini logo. Sizes XL FIRS approved senior, large, medium & small. You cannot get a better quality kit for this price! meneghini goalkeeper neck guard - Dark blue simple keepers neck guard with comfortable velcro fastening. Shown above left. Sizes Large senior or Small. meneghini goalkeeper neck and collar guard - Dark blue keepers neck/collar guard with comfortable velcro fastening. Shown above right. meneghini goal keper thigh/knee/shin protectors - The set of leg protectors have tough padding which gives good protection to both keepers thighs, knees and shins. Made from a lightweight stretch lycra fabric, the comfortable fit ensures full flexibility of movement. A new product made specifically for roller hockey. Dark blue colour. Junior/senior size in stock. Similar product to the Colombo 'Spinner' set shown above. meneghini inner gloves - Black top quality re-inforced keepers inner gloves with extra knuckle protection. All sizes stocked. Also, replica watches uk are now more realistic and similar to their genuine counterparts, so buyers do not feel that the replica watches sale are purely imitation. The fact that the rich and famous regularly utilize rolex replica uk to express their status has made replica pieces all the more popular. People see their favorite celebrity donning a certain watch, and all of a sudden they want one too. It is difficult to have what rolex replica sale have, though, as they have exorbitant amounts of money to spend. Therefore, people can get as close as possible by purchasing a replica of the desired item. Patek Philippe Classic Square Automatic rolex replica sale are perfect, as a replica Patek Philippe Annual Calendar Men’s watches can be easily misconstrued as real, while other, larger items like cars cannot be.